Constructed from aluminium oval tubing. New "S" bend design provides maximum space for the patient to fit between the armrests. The seat is made from a high density plastic to minimise flex. Fitted with rubber suction tips. 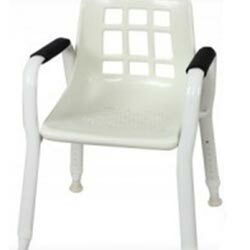 Perfect for hospitals, nursing homes and other institutional use.